(Heerbrugg, March 9, 2012) – The new Leica Lino L360 is the perfect tool for the tradesman. Whether for laying floors or bonding edging, for all interior and exterior levelling and aligning tasks, the line laser projects an exact horizontal laser line all round. The Leica Lino L360 is therefore an ideal addition to the line and dot lasers of the Leica Lino series. 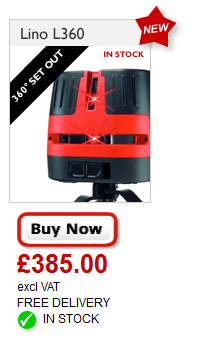 The Leica Lino L360 projects a laser line all round with millimetre accuracy. Reference points and lines can thus be quickly transferred from one wall to another without having to rotate the instrument. That is a crucial advantage when creating height reference points. Furthermore, the horizontal laser line can be projected very closely to the ground. This particularly simplifies laying floor coverings and controlling heights. Moreover, the Leica Lino L360 provides an additional 180° vertical laser line for further possible uses. The Leica Lino L360 can be set up easily and quickly. The user interface with only two keys is self-explanatory. Thanks to the self-levelling, minor inclinations are automatically compensated for. Where greater tilting occurs, the laser lines blink to indicate that the self-levelling function is no longer active. The self-levelling function can also be switched off manually using the lock function. On the one hand this serves as transport protection and on the other allows the laser lines to be projected in any position. The Leica Lino L360 is a rugged instrument with protection class IP65, i.e. it is dust proof and protected against hose water. Furthermore, thanks to the rechargeable battery pack, its lengthy operating time of up to 20 hours is also a convincing argument. A multi-functional adapter which can be used either as a small tripod or magnetic wall holder is included in the scope of supply. For simply setting up the Leica Lino L360 and adjusting the height, Leica Geosystems can provide the new Leica TRI 70 elevator tripod (working height 40 to 115 cm) and the TRI 100 (working height 70 to 174 cm). With the Leica CET103 elevator tripod, a working height of up to 246 cm is provided. Leica Geosystems stands for the highest quality. That’s why Leica Geosystems offer a 3-year warranty on all Leica DISTO™ instruments, if the customer registers the product within 8 weeks of the date of purchase at www.disto.com. This entry was posted on Thursday, May 3rd, 2012 at 1:10 pm	and is filed under Leica Laser level, Leica Lino L360. You can follow any responses to this entry through the RSS 2.0 feed. You can leave a response, or trackback from your own site.